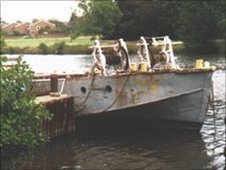 The worlds' oldest aircraft carrier is being restored at the Fleet Air Arm Museum in Somerset. A 1918 Thorneycroft Seaplane Lighter was discovered in the River Thames by a maritime journalist who saw a rusting hull sticking out the water. Museum director Graham Mottram said he was astonished at the discovery. "I was well aware of the story of these seaplane lighters, but was astonished to find that one had survived intact," he said. "My short walk along the deck was some of the most exciting steps I have ever taken!" After seeing the aircraft carrier for himself, he immediately arranged for it to be carefully lifted from the water and transported to the museum's restoration hanger. Restoration of the seaplane lighter has revealed many of the craft's original features. Details including the original Boat Number H21 along with the Ministry of Defence's required details of craft length LVIII (58ft) and the War Department's broad-arrow symbol. Other interesting details are the original crew quarters in the bow. These would have been used by the deck crew to shelter from the weather and sea conditions whilst under tow, and to store ropes, oil, tools and other small items required to service the lighter and its transported aircraft. 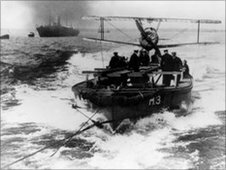 The 1918 Thorneycroft Seaplane Lighter was built so that aircraft could extend their range prior to take off and be covertly moved. Four prototypes were made and it proved so successful that a further 46 lighters were then made. There is only one other example of these early aircraft carriers. It is largely submerged and has corroded to almost nothing. The remains are entombed in thick black mud on the banks of the River Hamble in Hampshire however at low tide it is proving to be an invaluable source of reference and donor parts. Ultimately the Fleet Air Arm Museum hope to complete the restoration and display the world's oldest aircraft carrier with a World War I Sopwith Camel on board as if ready for take off.